5 Fun, Heart Warming Stars!!! The man next door intrigued Juliet, try as she might to simply live life and build a life for her daughter, she couldn’t ignore her new neighbour. Will this be the happiness she deserves? The Shakespeare Sister series is one I have thoroughly enjoyed and loved every minute of. I’m sad to see this series end. However, Carrie Elks has not disappointed with the fourth and final book in the series. I was hooked to Juliet’s story from start to finish, and I honestly struggled to put this book down. I loved Juliet, even though the last year or so had been hell for her, she was still very upbeat and wasn’t going to let life bring her or her daughter down. She worked hard to be able to fend for herself and not rely on her ex husband who at ever turn tried to control her every move. Her strength and determination are an inspiration to everyone. 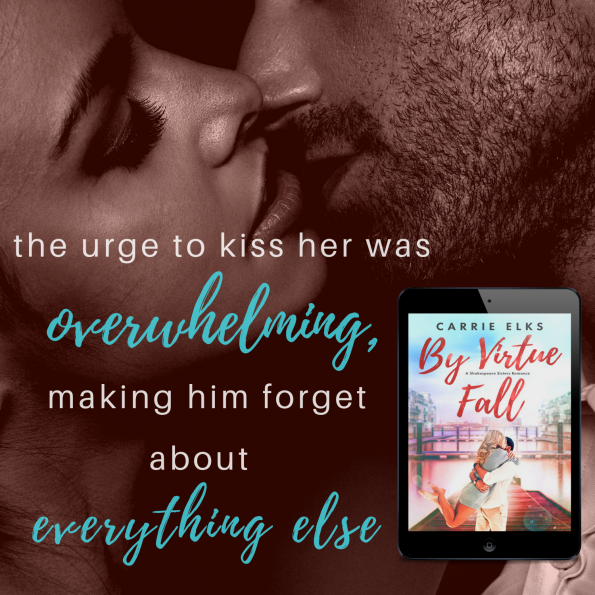 By Virtue Fall is a story that has that perfect balance of heartache, humour and romance. I loved how Juliet and those she chooses to surround herself with, were about embracing life and having fun. Her neighbour was a great guy, supportive, friendly, and fun, it was hard to not get sucked in by the happiness that surrounded him. Carrie Elks has delivered another fabulous story, and one fantastic series, one of my top reads for 2018!